Technology developed at the Bernal Institute at the University of Limerick could help with the global problem of dealing with plastic waste. Scientists working at the Irish Composite Centre, which is based at the institute, can now convert plastic bottles into a high-value composite material for use in cars and tractors. Rather than being regarded as an environmental hazard, the bottles can be ground down and transformed. First, they are woven into a metal thread, then into a high-tensile fibre and finally a hard-wearing material that can be used for tractor and car parts. Dr Walter Stanley, who is leading the SerPET project, said Ireland had one of the worst reputations in Europe for producing plastic waste. Each year, 61kg of plastic are produced per person in Ireland and 20 million tonnes of plastic are now produced globally. A large proportion of this plastic is made up of single-use plastic bottles which, apart from polluting the landscape and seascape visually, also degrade over time creating further problems downstream for nature, animals and humans. Dr Stanley said the technology being developed at the centre has the potential to turn plastic bottles into a valuable raw material, stimulate greater recycling and lead to less litter and less incineration. 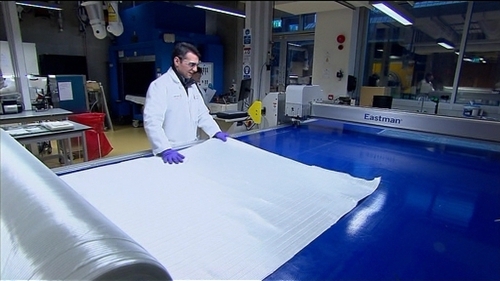 The self-reinforced composites can also be made at lower temperatures and are therefore more energy efficient. He said they can be used in many applications including car, tractor and lawnmower parts, which would themselves be recyclable. The director of the Bernal Institute, Prof Luuk van der Wielen, said much of the work there is aimed at solving global problems, such as getting rid of our waste, as well as renewable energy projects, all of which are key to the circular economy. He said he has no doubt that the technology developed by Dr Stanley's team will play a role in tackling global waste.